Well, my first weekend in Juba was far more exciting than I anticipated. 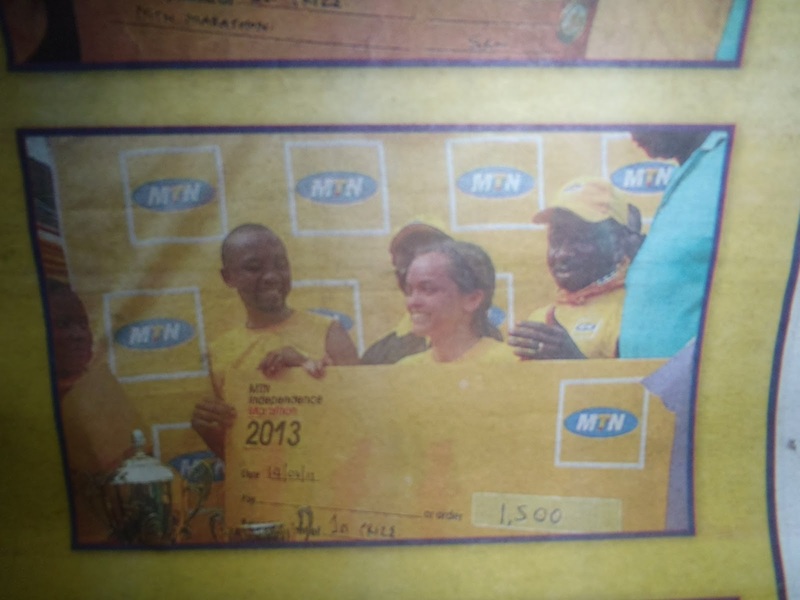 On Sunday there was a race sponsored by MTN, one of the largest cell phone and mobile networks here. I and the girls and a few other staff members ran as well. You could run 5k, 10k, or 21k (half-marathon). We all did the 5k and there were probably 75 people running that race. The turn-out was bigger than I expected. Lots of folks, and a good number of foreigners as well. We were all given yellow MTN shirts and numbers. Not all were serious runners. A few gals were running in ballet flats and skinny jeans, but there were legit runners there too. South Sudanese are tall and for sure, aside from the younger girls from the center, I was the smallest in the crowd. No contest. I had a lot of fun. There were lots of curious on lookers and they did a good job of stopping traffic and passing out water. The finish line was pretty disorganized. They handed you a slip with the number you placed and you were supposed to go register at a table. By the time I got there it was chaos and they had to get policemen over to get people to form a line. Eventually I made it to the front. And, Surprise!, I ended up placing 6th overall in the 5k, and I was the first female foreigner so I won a cash prize! They made me pose with a giant check and a local TV station had me say a few words. Bizarre, really, but exciting. I’m supposed to go tomorrow to collect the money. I went today to have them scan my ID and confirm my name for the check. When I walked into the waiting area at the office I explained to the security guy that I had won a prize in the 5k and he kind of looked at me amused, and someone in the room was like “You were a winner?” And I said “Yeees…” and kind of laughed and then everyone in the room started laughing. Haha, glad I can amuse! I won 1,500 SSP, which is about $375. So not shabby at all! I plan on using the money to maybe buy the girls some ice cream or something since they didn’t win any prizes, but use most of it to buy beads and other supplies to start getting the handicrafts program going. I may buy myself a necklace or something 🙂 but really it feels ridiculous to keep the money for myself. My picture with a giant check even made it in the paper. Also, interesting note, one of the sponsors for the race was a cigarette company. So they had their signs up advertising at the event. The cigarette posters said “Expand your imagination. Just say Yes!” My, my, my.